You will cross the Mississippi River into Illinois with its roads lined by cultivated fields as far as the eye can see. At this point your patience and your nerves will be severely tried but you will stick to your objective. The plains of the Middle West will give your tired legs a rest before you attack the Blue Mountain of Pennsylvania and then civilization. 1928: The first orgnaized race between LA and NY in 84 days (199 runners started, which is the largest number ever for a transcontinental race). These 2 races are known as the Bunion Derbies and were organized by C.C. Pyle on the same principle as the Tour de France: the time recorded on each daily stage made it possible to rank the runners. 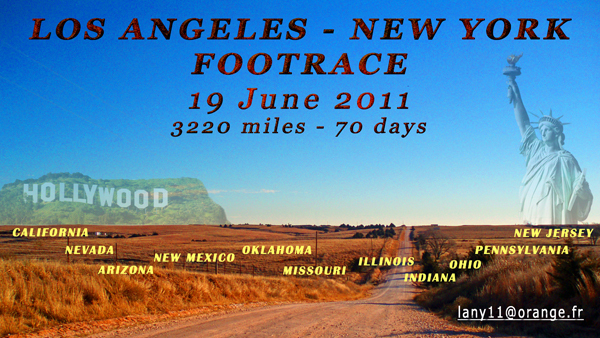 1992 – 1995: The Trans America Footrace was organized four times by Jesse Dale Riley and Michael Kenney from LA to NY in 64 days. Ever since the pioneers set foot on American soil, crossing the continent has been a myth. Through the Internet we have learned that scores of people have crossed the country on foot, on roller skates, on bike or by car. This immense continent never leaves one indifferent and continues to captivate modern day adventurers.